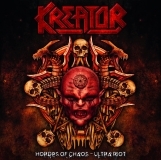 KREATOR - HORDES OF CHAOS - ULTRA RIOT (2CD BOX SET) | Online Shop | Wizard LTD. Album: "HORDES OF CHAOS - ULTRA RIOT (2CD BOX SET)"
The rolling thunder is growing louder and great events are foreshadowed again: Germany’s most eminent trash metal act, Kreator, are set to release their latest studio album "Hordes Of Chaos" as a high quality boxset on July 12th,2010. Hordes Of Chaos- Ultra Riot is a must for every fan. Hordes Of Chaos was recorded at Berlin’s Tritonus studios under the direction of producer Moses Schneider. The album was mixed in London by Colin Richardson (Slipknot, Bullet For My Valentine, Cradle Of Filth, etc.). The new box set includes the "Hordes Of Chaos" album as a digipak with a new cover, a new booklet (incl. new liner notesby Joel McIver) and 2 enhanced videos. The bonus CD comes in a cardboard sleeve and contains 2 coverversions (from german band Slime and Bad Religion) and 5 previously unreleased demo songs. On top of that the boxset contains a high quality 12 pages photobook by famous photographer Harald Hoffmann, a full coloured poster of the album cover, a full coloured photocard, a full coloured sticker and a voucher for the Kreator merchandise shop at www.kreator-terrorzone.de. All this comes for a very reasonable price.